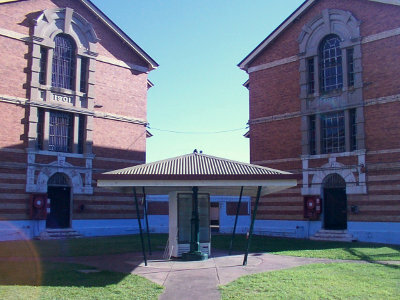 Brisbane’s heritage-listed Boggo Road prison opened in the 1880s and closed in the 1990s. During that time it developed a reputation as one of the more notorious prisons in Australia and there are many stories to be told about it. Most of the prison buildings on the reserve are now gone, with the exception of ‘No.2 Division’, which opened in 1903. The surrounding prison reserve is owned by the Queensland Government and will eventually be home to a range of residential, retail and government facilities. Some of these buildings have already been constructed. Plans are currently being developed to refurbish No.2 Division and transform it into a vibrant dining/arts/heritage hub. The original 1903 structures, including the three cellblocks, will remain in place but some 1980s additions could be removed. These plans have yet to be approved. It is currently anticipated that any refurbishment will take place @2016. If the plans go ahead as they are, the Boggo Arts & Heritage Alliance hopes to have a major role in transforming the old prison into a successful and innovative arts and heritage venue.